Thursday I cut all the bottoms for the puzzle boxes from Curly Maple wood. 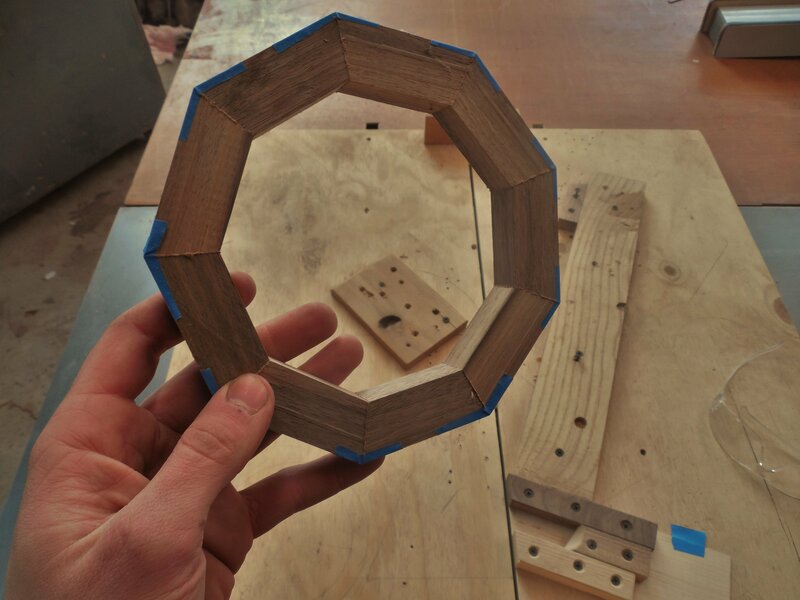 Nine triangles will fit together perfectly to make the bottom for one box. 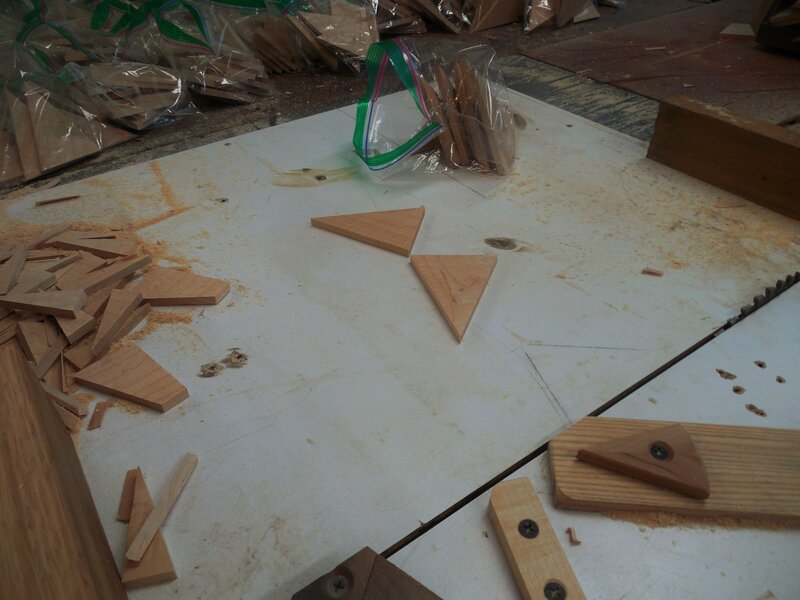 Before I glue the Maple triangles together they will all have to be grooved and splined. Splines will be a significant amount of work to add to the boxes but its definitely worth it to me for the strength and peace of mind they will provide. When I milled my lumber for the boxes, I made sure to divide the boards into segments only big enough to make individual boxes so that I could keep the color tone and grain pattern consistent for each box. Top frame for a Pi box. Tuesday and Wednesday I mitered all 50+ walnut frames for the top of the Pi boxes. With nine sides per frame times 60 (about ten extra frames for spares) it took me 1,000 cuts on the table saw to finish! I've calculated how many cuts are done on the table saw per box and I came up with about two hundred unique cuts! That's a total of 10,000 tablesaw cuts for this production run. Looks like I have my work cut out for me. 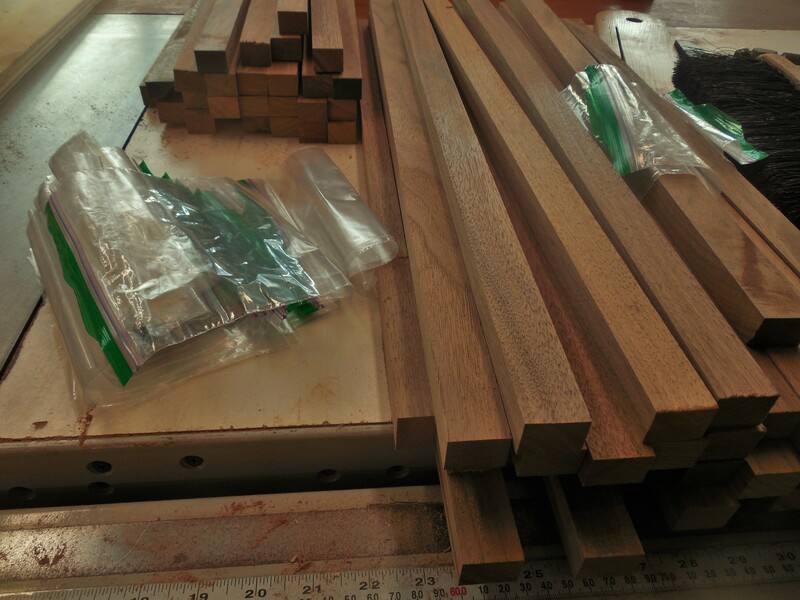 I made sure to keep the walnut pieces from mixing to avoid color and grain pattern variation in the frames. I cut the frames one at a time from 24" strips of walnut and immediately placed the pieces in a bags to keep them sorted. I'll need to cut a few slots for my wooden hinges and then its off to the glue up stage. Eventually these frames will be mounted on my lathe and turned to make the center round and the top radius. I'm not particularly looking forward to that step but it will probably be another week or two before I move to that stage.